Carl Icahn just appeared on CNBC’s “Halftime Report” with Scott Wapner again even though last month he told the anchor that he’s “never going on a show with you again, that’s for damn sure.” Wapner started the segment by asking him why he took such a big long bet? Icahn then proceeded to touched upon Ackman’s belief of Herbalife being a pyramid scheme. He said Ackman has been unfair to Herbalife shareholders. He then talked about Ackman’s statement at the Harbor Investment Conference this week about his law firm Sullivan & Cromwell agreeing with him that it’s a pyramid scheme. “The most interesting thing I thought about that whole conference is Ackman stated his law firm Sullivan & Cromwell, his attorneys…he said Sullivan & Cromwell is comfortable that HLF is a pyramid scheme,” Icahn said, adding that he says they have never said that publicly. Icahn said he likes Herbalife. Herbalife is at “the centre of paradigm shift right now”, he said.. He said multi-level marketing is a great way to retail products. In terms of his investment, Icahn said “Ackman is giving me a great opportunity.” He said he thinks the stock is cheap and that it’s going to grow. He then took a jab at Ackman’s mammoth presentation again. Putting a 300-page paper together “is nothing”, Icahn said referring to Ackman’s massive presentation he gave at a special Sohn Conference event in December. He said if you’re shorting a stock you should keep it quiet. “What is he doing? He goes in he has this, I call it a scheme, what he does is put out a 300-page paper…with no expertise,” he says. “I am not buying this company and putting money into it unless I’ve done a lot of research. Forget the fact that I don’t like him. The bigger a short position, the more enticing it is,” Icahn says. He also said that Herbalife is a company that could go private. Then, Wapner jumped back in to ask him if it’s business or personal again. He pointed out that he really accumulated this position after that CNBC battle they had last month. “Let me address that. If you look at my buying pattern you would say it’s not personal,” Icahn said. Wapner asked if he sees “real value” and if this is not an attempt to squeeze the “you know what” out of Ackman. Wapner wanted to know what happens if regulators come out on the side of Ackman? Icahn said he doesn’t believe the regulators are going to act because someone comes out and says you’re not doing your job right. “Look Ackman and I had our dispute. I don’t want to get back into that. I told you how I felt about that. This is about making money. I’m sure it’s about making money with him,” Icahn said adding that only time will tell. Wapner asked if there’s anything he wanted to say to Ackman. Yesterday, the billionaire investor got back at his rival Bill Ackman when he revealed a huge stake in Herbalife yesterday evening equal to 12.98%, or 14,015,151 shares. The stock started falling during Icahn’s talk, but it’s still up more than 6%. The SEC filing also suggested that the company could be taken private. Herbalife is the stock that Icahn’s decade-long rival Ackman, the CEO of Pershing Square Capital Management, is shorting. Ackman, who believes the company is a pyramid scheme, is shorting 20 million shares of Herbalife with a price target of $0. 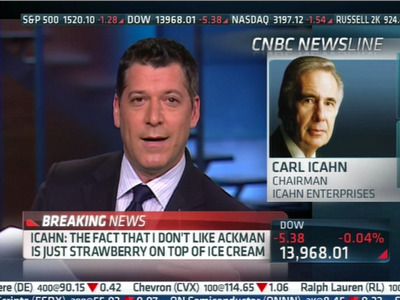 Last month, the two hedge fund titans brawled in a telephone interview live on CNBC with Icahn hurling zingers a Ackman calling him a “crybaby in the schoolyard” and Ackman saying Icahn is a “bully” and he doesn’t keep his word. Ackman responded this morning to Icahn’s latest move saying that he welcomes his investment in Herbalife and that he continues to believe the company is a pyramid scheme.